Available in all four of our available model styles, our 10-string guitars are defined by a set of key innovations and features. Ultra-close string courses make fretting and picking easy. Single, high E and B strings reduce overall tension on the instrument, ease fretting, and preserve the rich melodies and lead notes you’d hear on a standard 6-string. Combination pinned-pinless ebony bridge design mitigates bridge cracking and soundboard distortion over time. Precision-milled oxbone saddle optimize the intonation and clarity of each individual string. Resilient, laser-hollowed bracing bears the extra torque exerted by additional strings, so even our smallest parlor model can be configured as a 10-string. Our proprietary bracing is also designed to reduce overall weight and enhances the soundboard’s response so it fits and plays more like a 6-string. 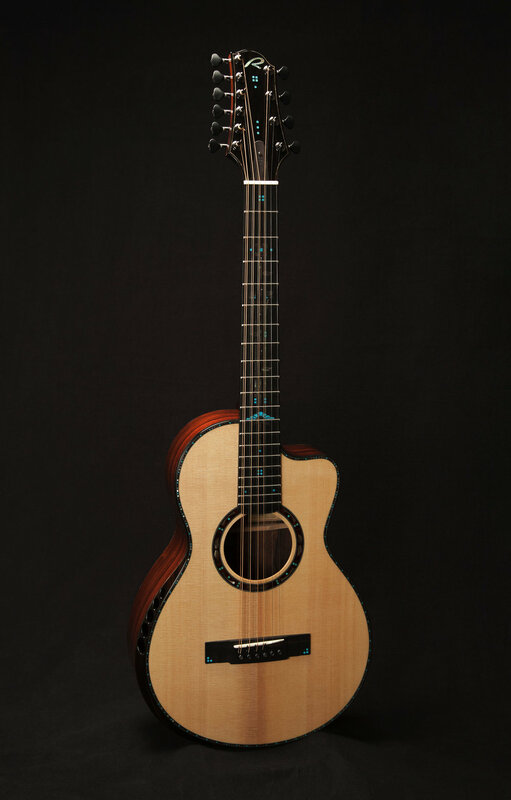 When we sat down with our friend, guitarist Eric Lugosch, to design “a 12-string guitar for fingerstyle players,” we observed the string courses on a standard 12-string are setup with the octave string above the main string. When you strum the instrument, you strike the higher-pitched octave strings just slightly before the standard strings with each movement. This arrangement is important because the lush chorus effect so desirable from a 12-string instrument essentially results from hearing the octave string vibrations just before the vibrations of the main string. But notice, when you pick an instrument, you thumb down on some strings (E, A, D) and pluck up on others (G, B, E). In a standard 12-string setup, plucking up on the G string course results in hearing the octave string after the standard string. So, we designed the nut and saddle on our 10-string to allow the octave G string to go below the standard G string, letting you hear the octave string first as you pluck up on the G string courses. 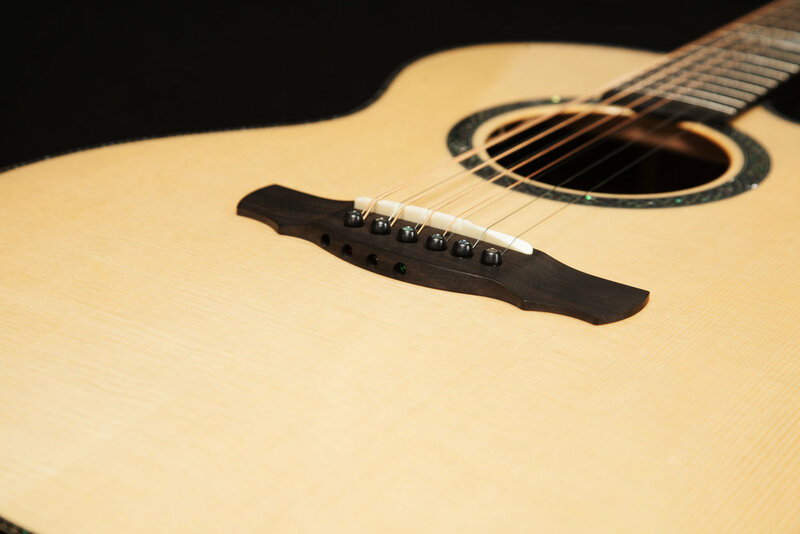 The nut and saddle on our 10-string also gives you the option to set the octave G string above the standard G string, if you’d like a traditional setup. Ultra-rigid, micro-adjustable truss rod supports a slim, fast neck. Distinctive, elongated 10-string headstock shape. String courses feature phosphor bronze extra-light gauge strings: .009 - .045. Standard light gauge single strings (High E - .012, B - .016).